...that the New Colonial Alliance is led by Admiral Mattius Drake, a turncoat officer of the UNSC Navy? 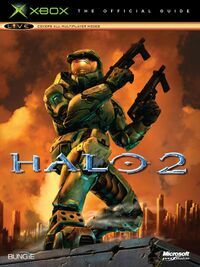 Halo 2: The Official Strategy Guide is the 224-page official strategy guide for the video game Halo 2 published by Piggyback Interactive. It is written in English and is a paperback publication. Designed to enhance the Halo 2 experience for newcomers and Halo: Combat Evolved veterans alike. Before the release of Halo 2, the page for it at Xbox.com was made to look as though it were a series of screens at the helm of a Covenant ship, complete with a Covenant language made of triangular shapes. The Game Guide uses a few of these characters to denote the placement of Covenant vehicles on their maps. On the Contents page, Master Chief is shown about to kill a Brute on Earth, which comes from the Halo 2 E3 Demo trailer. The book wrongly prints that there are achievements in Halo 2 for Xbox, when they are only actually available in Halo 2 Vista. On page 7, there is a misprint that says the MJOLNIR Mk VI was upgraded; in reality, the armor was upgraded to Mk VI in the first level, the Heretic. On page 13, the reloading signal is depicted as three bullets; in the game, the reloading symbol is a circular arrow. On page 41, the guide claims that a Grunt Minor's armor is yellow, when in fact it is orange. On page 46, the strategy guide calls a Brute Plasma Rifle a Brute Plasma Pistol. On page 30, the guide incorrectly labels the Fuel Rod Gun as the Fuel Rod Cannon. On page 110, there is a Sangheili Honor Guard with blue (Minor Elite) armor. On page 119, the strategy guide mistakenly called the Enforcer a "Sentinel Major". However, it stated that the Covenant called it "Enforcer" on page 118. Back cover of the guide. Guide to the Covenant language.